Manchester United manager Jose Mourinho has reportedly been in touch with the president of his old club Real Madrid, Florentino Perez, about replacing Julen Lopetegui as head coach at the Bernabeu. 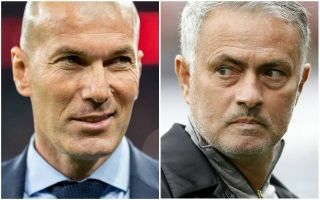 This astonishing claim comes from Spanish outlet Diario Gol as talk hots up over Mourinho’s Old Trafford future, with sources close to Zinedine Zidane confident he could get an offer to discuss replacing the Portuguese in the very near future. These sources have told CaughtOffside that Zidane has already contacted two United players – his fellow Frenchmen Paul Pogba and Anthony Martial – about taking the United job, encouraging them to stay at the club. It may be that this has prompted Mourinho to think even harder about his future in Manchester, with Diario Gol contacting Perez to say he’d be ready to return to the Spanish capital if Lopetegui were to go. It remains to be seen how likely this is as Madrid only named him as their new manager following Zidane’s departure this summer. Jose Mourinho preparing for life after Manchester United? Mourinho’s time at Real also ended badly, with the team losing the Copa del Rey final and finishing some way behind Barcelona in La Liga. The 55-year-old also notably fell out with some high-profile players at the club, most notably Iker Casillas, whom he froze out of the first-team for some time. Increasingly, the former Chelsea and Inter Milan boss seems a risky appointment for top clubs as his record in recent years is certainly far less impressive than earlier in his career.